Officials at Shanghai International Port Group (SIPG) have told Splash about the rationale to buy into Orient Overseas Container Line (OOCL). While Cosco’s courtship of the Hong Kong liner has been telegraphed for a long time, SIPG’s seat at the eventual negotiation table caught many by surprise. The operator of the largest container port in the world by throughput says it is increasing investment in the shipping sector as it looks to strengthen the synergetic development of both its ports and shipping businesses. Yesterday, Cosco and SIPG jointly announced a deal to take over OOCL’s parent, OOIL, at an offer price of HK$78.67 ($10.07) per share. Upon completion of the deal, Cosco will hold 90.1% of the Hong Kong line while SIPG will hold 9.9%. SIPG’s investment in the deal could reach RMB4.92bn ($723m). The combined Cosco Shipping Lines and OOIL will operate more than 400 vessels over a much expanded network, with capacity exceeding 2.9m teu including ships on order. An official at SIPG told Splash that the equity investment in OOIL would facilitate the optimisation and innovation of the company’s operations and enhance the company’s international competitiveness. The container shipping business will also create synergy with the group’s port terminal business. SIPG’s move to invest in OOIL was also no doubt motivated by the Hong Kong firm’s Long Beach Container Terminal. OOIL’s other port asset, a berth in Kaohsiung in Taiwan, might prove politically harder to digest however. 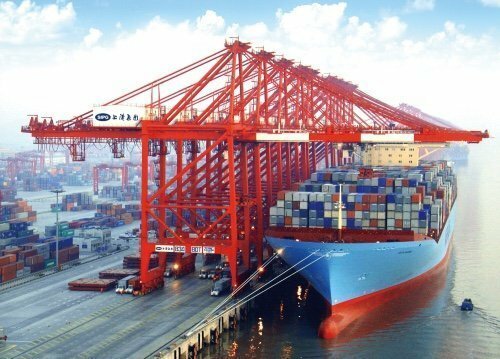 In June, China Cosco Shipping Group acquired a 15% stake in SIPG from Shanghai Tongsheng Investment with an RMB18.9bn ($2.78bn) investment, making it the third largest shareholder in the port group. Cosco hopes to strengthen its strategic ties with SIPG through the deal and the two parities will work together for more investment projects in the future. SIPG has been consolidating its shipowning assets in the recent years. The company runs a fully-owned containerline Shanghai Hai Hua Shipping (HASCO) and it also acquired a 79.2% stake in intra-Asia container shipping firm Shanghai Jinjiang Shipping in July 2015.